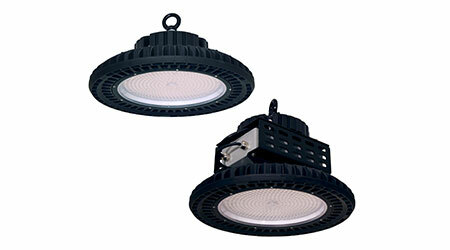 Champion High Bay (CHB) Series LED Pendants deliver up to 28,500 Lumens. The CHB is ideal for high ceiling applications such as warehouses, large retail environments, storage facilities, and sports arenas, and is available in two wattage packages: 200W/22,000 Lumens and 240W/28,500 Lumens. Utilizing custom optic lensing, the CHB is available in three beam distributions: 45-degree, 90-degree and 120-degree. The luminaire comes standard with 120 feet of flexible cable and eye bolt for hook mounting. Other mounting options include twist lock receptacles for retrofit opportunities or a U-Bracket for conduit, ceiling or wall mounting. Motion sensor, dimming capabilities and battery back-up options are also available.